Cindy Bumgarner Jorth was truly a 3-sport athlete. Playing high school ball at Morton, she was all-conference for 4 consecutive years in basketball, 4 consecutive years in softball and 3 consecutive years in volleyball. In addition, she garnered multiple all-state basketball honors during her junior and senior years. She was a Converse All-American in her senior season (1984). Cindy left high school with 1,977 career points that ranked her 15th among all-time IHSA girls basketball scorers. She also led the Potters to the IHSA volleyball state finals in 1981 and was named to the all-tournament team. She was accorded all-state honors in volleyball during her senior season. 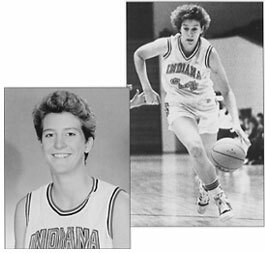 Accepting a full scholarship to play basketball for Indiana University, Cindy had the distinction of being named to the All-Big Ten team in each of her four seasons. She was named to the "Women's Basketball Magazine's" freshman All-American 1985 team and gained "Fastbreak Magazine" All-American honors as a junior. Cindy ended her career with 1 ,836 points, the 3rd highest in Hoosier history. Her 17.3 p.p.g. career average is still highest in Indiana University history.